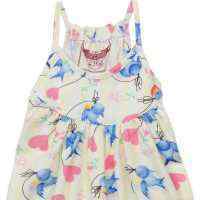 This unique organic cotton toddler girl skirt set features soft organic cotton and a sweet robin applique. The shirt and skirt feature soft environmentally friendly 100% organic cotton knit fabric in a beautiful shade of yellow. This set comes with the striped tank and layered yellow skirt in the first photo. The other photos on toddlers show how versatile the top and skirt are, in that they can be paired with other skirts, tees, and leggings. 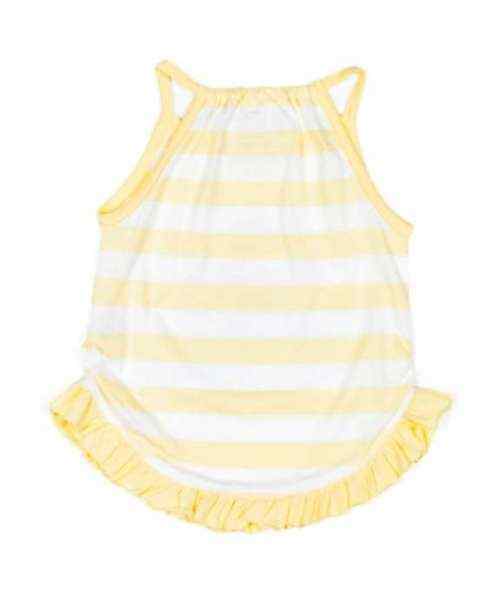 The cute yellow and off white striped sleeveless tee features yellow straps and yellow trim at the armholes and front neck. 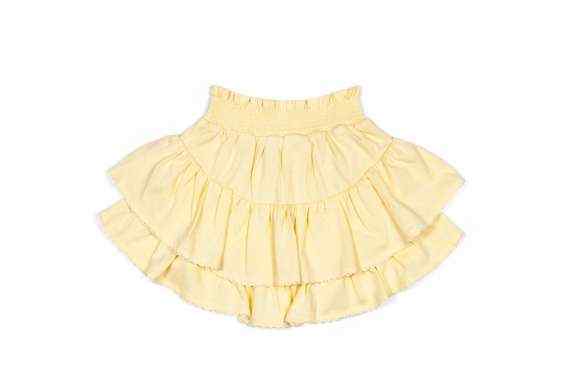 The pretty yellow ruffles around the bottom hem of the tank top and the beautiful off white trim at the bottom of each layer on the skirt, give this outfit a sweet vintage look. 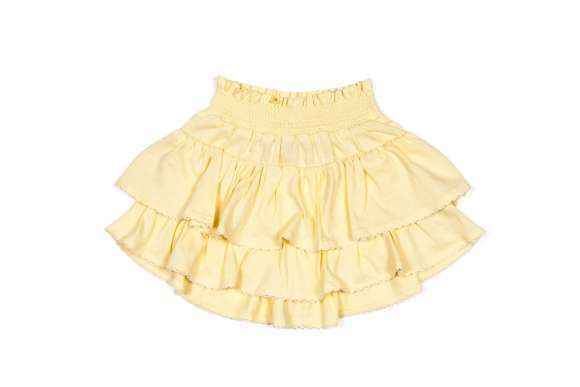 This unique organic cotton toddler girl skirt set will keep her cool on hot summer days. This modern baby and toddler girl outfit is ideal for the pool, the beach, and to wear every day. 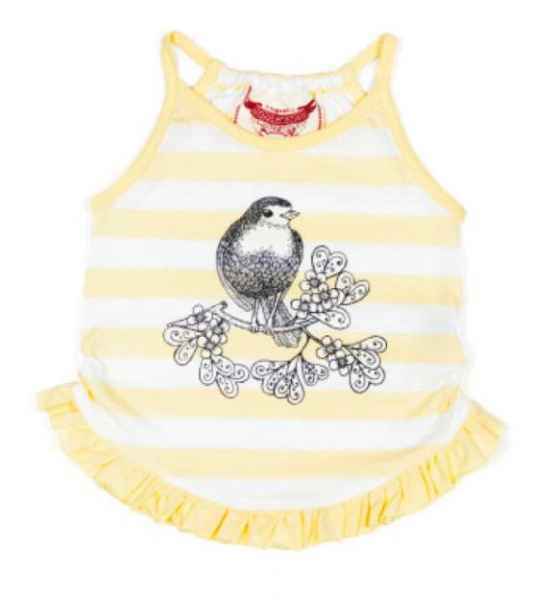 Throw a cardigan on so your infant or toddler girl can wear this cute yellow outfit into the fall and on cool early spring days. This eco friendly baby and toddler outfit looks cute with our yellow striped leggings and the skirt looks cute with our vintage dog and cat T-shirt, both available as parts of sets in the "You might also like" section. She will love wearing this modern earth friendly outfit because the cute tiered skirt features a super comfortable stretchy gathered elastic waist. You can feel good about your children wearing our earth friendly clothes because they feature cotton raised without any chemical fertilizers, so they do not irritate the delicate skin of babies and toddlers. We have taken the guesswork out of matching, with this perfectly coordinated unique organic cotton toddler girl skirt set.